Signia-Siemens Silk has made its mark in the hearing health market with the smallest ready-to-wear and most popular completely in the canal (CIC) hearing aid. The Signia Silk is powered by the revolutionary Primax technology. The clinically proven Primax platform and the Silk hearing aid is built to be a discrete alternative of assistive listening instrument. You heard that right! Silk Primax is the perfect listening device portfolio which will help you hear better and will make your life sound brilliant again. 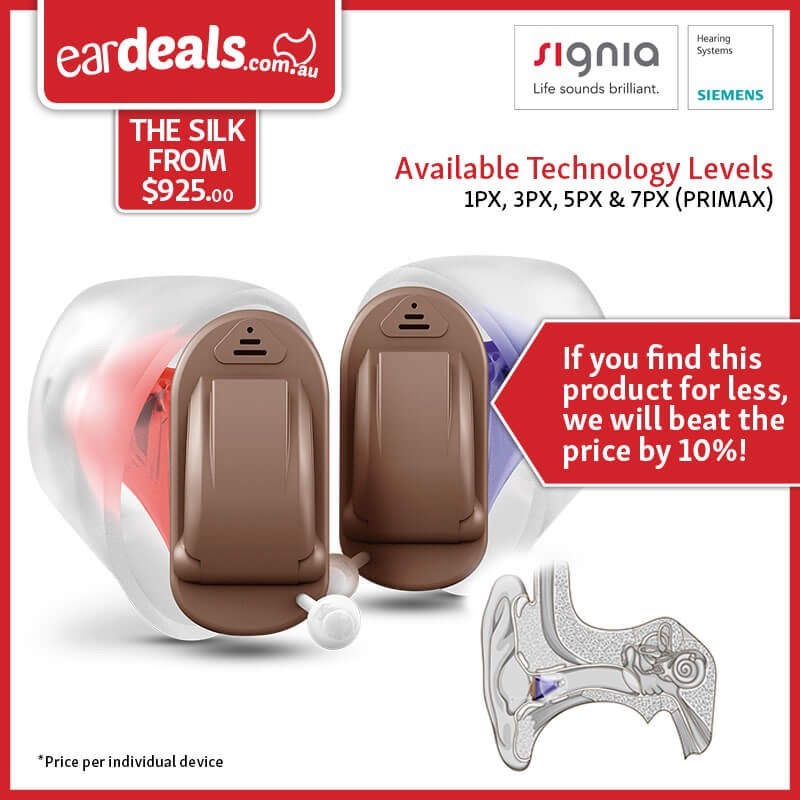 EarDeals stock the Silk Primax hearing technology device, such as the Silk 1px (new) essential level, the Silk 3px standard upgrade, the Silk 5px with enhanced specifications and the Silk 7px highest technology level with the most features. The Silk product line has a variety of audio processing capacities which serve a wide range of consumers and their hearing test results. The primary function of the hearing aid is to help you better perceive sounds in every listening situation. The Silk products have SpeechMaster adaptive environmental system which has a noise reduction process and speech amplification feature, working together with the directional single microphone on the device. All product levels have 6 programs and wireless connectivity to many different technological instruments including the easyTek devices, remote controls, smartphones. The Silk family of hearing aids gain audiological benefits from the Notch Tinnitus therapy and Telecare 2.0 program for your hearing health professional’s remote supervision. The 1px is the newly introduced essential technology hearing aid from Signia Siemens, the Silk 1px has an impressive 16 hearing channels and the digital signal management as the fundamental system for noise reduction, amplification and directionality features. The former entry-level Silk 3px hearing aid is now the standard upgrade which has 24 sound channels for a wider range of signal perception and amplification supported by the directionality features and the 3-level adjustments to help tone down the noises from your conversational background. The Signia Silk 5px enhanced listening device is powered by the 32 sound channels which helps to intensify the sounds you focus on through the aid of noise reduction; improved with 5 adjustment modes and the directionality program of the device. The 5px product level can be programed with three listening settings and the instrument has the basic features of the premium upgrade with HD Music and eWindScreen (to soften wind noise). Continually succeeding the Signia Siemens top hearing aid, the Silk 7px is the most advanced technology level in the portfolio packed with 48 hearing channels for the finest amplified targeted sounds supported by the noise reduction program that has 7 adjustment levels. The product integrated ground-breaking technology such as the EchoShield program that removes sound reverberations and the Spatial Speech Focus (binaural) for a powerful sound collection from any directions. This technology level has extended fitting bandwidth (more types of hearing loss) as well as increased settings in HD Music and eWindScreen control. Knowing that Silk Primax hearing devices offer a variety of technical specifications according to the range of audio processing capacities and beneficial features. The Signia Siemens Silk 1px can support mild to moderate hearing loss. The entry product is suitable for people with a generally quiet lifestyle who like to stay at home, watch tv and listen to music. Engaging in small personal talk and occasional conversations can also be supported by the listening instrument. Whilst the Silk 3px hearing device is suitable for people whose hearing loss ranges from mild to moderate with a greater demand on features and control. Someone with a moderate lifestyle that entails quiet living plus a little more conversation like occasional meetings at work can be supported by the 3px product. People who have moderate to severe hearing losses and live a semi-active lifestyle often; attending work conferences or business meetings in places like restaurants will experience greater success with the Signia / Siemens Silk 5px advanced hearing aids. The Signia Silk 7px premium technology hearing aid serves complex situations for moderate to severe hearing losses. Hearing device wearers, who live a fully active lifestyle and enjoy outdoor activities and social events like concerts can be supported by the audio processing capabilities of the 7px device. Sydney EarDeals Clinic Now Open!